The Language Editor in EasyCart allows you to adjust every phrase and element within the shopping cart system. This powerful feature lets you customize headings and details to fit your ecommerce needs. The first step is to setup which language packs you wish to run your store. The most common is to setup one single language system. If you wish for users to switch between languages, we suggest you install the language selector widget from within WordPress widgets area in a menu of your choice. This gives the user the opportunity to actually switch languages. If you have no need for extra languages, we suggest you delete them and only use the minimum language packs required. This section determines which language to load into the editor below. A language pack must be installed in the step above before selecting here. **Note: Languages may be exported, but creating and setting up a new language system requires several steps to complete. Contact your EasyCart specialist on dealing with these scenarios. This section lets you expand and collapse the various language sections. 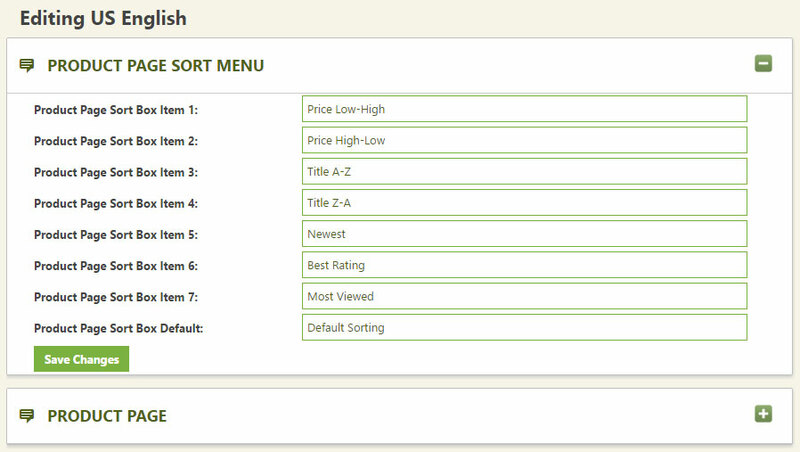 EasyCart has broken the sections into easily recognizable sections to allow editing and locating quickly. Be sure to select the correct language in the previous panel before editing.